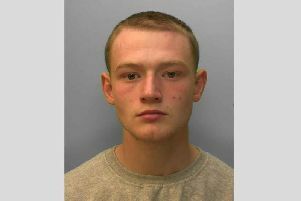 A Chichester City winger has appeared in court accused of knocking a young man unconscious outside a nightclub and leaving him with facial fractures. A jury at Kingston Crown Court was told today that semi-professional footballer Josh Clack, 24, a winger with the Southern Combination Premier Division club punched 20-year-old Kieran Smithers unconscious outside Guildford’s Casino club. Clack, of Oakwood Close, Midhurst, West Sussex has pleaded not guilty to inflicting grievous bodily harm in the early hours of October 18, 2015. He claims that the single punch he threw was an act of self-defence, and that he had feared Mr Smithers was about to attack him as two groups faced each other outside the club. The incident happened after 3am. Prosecutor Mr John Coates told the jury Mr Smithers was walking alone after a night’s drinking when he was involved in an initial incident with Clack’s friends outside the club. Two witnesses, who were waiting for a lift, were concerned for Mr Smithers’ safety and they and the complainant approached a group, which included Clack. “In the second incident the prosecution say Josh Clack deliberately punched Kieran Smithers in the face or head, causing really serious harm,” said Mr Coates. Mr Smithers spent 9-10 days in hospital, where a CT scan showed he also had bleeding inside the brain. Earlier on the night of the incident he had dined with his parents in Woking before joining a pal at a pub and bar in Guildford. “He remembers he was fairly drunk,” said Mr Coates. Door staff tried to calm the situation, which was captured on CCTV and Mr Smithers crossed the road, but returned with the two witnesses. The prosecutor continued: “This defendant deliberately punched him in the face, but that is not caught on CCTV. “He squared up to get in Kieran Smithers’ face and was swinging for him and that punch knocked him out. “Kieran Smithers fell to the ground like a tree. He was out cold and fell backward and hit the back of his head on the concrete. Clack gave himself up to police on October 30 after learning of the investigation. Mr Smithers remembers nothing of the evening, but watched CCTV of the first incident and told the jury: “It appears they’ve swung for me as I walked past. “It looks like he’s got me by the collar of my shirt,” he added, referring to a man in Clack’s group.